An interesting phenomenon in connection with the development of suburban settlements on the Trans Kalimantan Road corridor was the suburban settlements development. The development give a poor impression of an adequate city residential neighborhood or tend to decrease its carrying capacity, as well as forming an irregular settlements pattern. 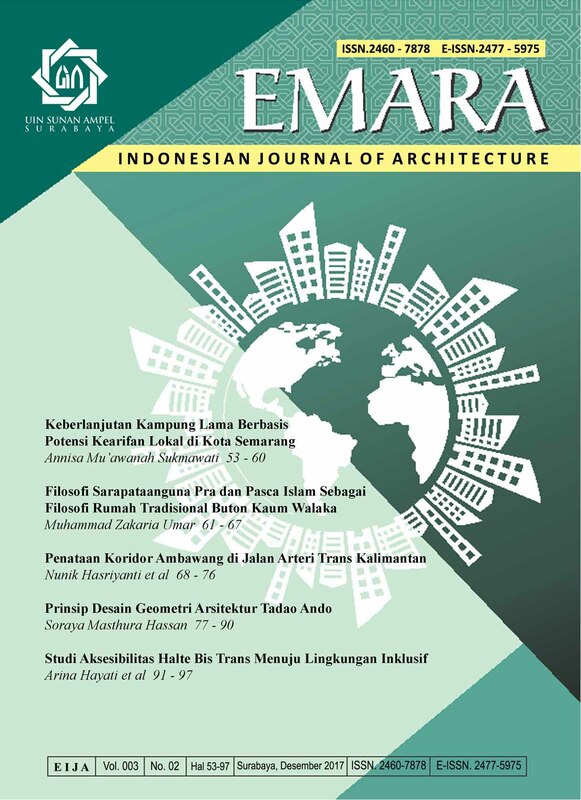 The study aimed to identified and analyzed the environmental settlements patterns in the Trans Kalimantan Road corridor and the spatial built-in changes in the provincial road corridor. This was a qualitative descriptive research with situational analysis on case studies through field observations including built-in space and infrastructures identification in the Ambawang corridor. The existing condition analysis was conducted through the aerial photographs and 2016 thematic maps interpretation to identified the spatial space spreads built-in along the Ambawang corridor. A study on Ambawang Corridor sustainability, proposed a development scheme that described through the Trans-Kalimantan Ambawang corridor arrangement, warehouses and shops revitalization - renovation as well increasing the green open space along the corridor. Carmona, M., & Tiesdell, S. (2007). Urban Design Reader. Oxford, United Kingdom: Taylor & Francis Ltd.
Lynch, K. (1987). The Image of the City. Cambridge, MA: MIT Press. Pujantara, R. (2013). Penataan Kawasan Jalan Somba Opu Sebagai Salah Satu Kawasan Berkarakter Di Kota Makassar. Jurnal Forum Bangunan, 11(2). Sumayku, A. R., Egam, P. P., & Waani, J. O. (2016). Fragmentasi Serial Vision Dalam Pembentukan Citra Kawasan. Studi Kasus Koridor Jalan Pierre Tendean. Jurnal Arsitektur DASENG, 5(1), 83–91.